There's been much buzz these past couple of days around the leaked images and videos of the 4th generation iPhone. Despite the current hubbub, secrecy is at the heart of the Apple ethos, and it serves two primary purposes: to protect trade secrets, and to create a buzz. When products leak, it's like finding out about your own surprise party. Most of the fun is gone. Hell hath no fury like Steve Jobs finding out about leaked Apple products. Over the past decade, Steve has had many reasons to unleash his anger about leaked products; let's take a look at the rogue's gallery. If the magnitude of a leak is a function of the time between the initial leak and the actual product announcement, then the 5th generation iPod (now dubbed the iPod classic) could be seen as a relatively minor blip on the radar. While the 5th generation iPod introduced support for watching videos -- something that Steve previously scoffed at -- leaked images did not appear till just a few hours prior to Apple's "One more thing..." special event. Although the leaked images showed a noticeably different industrial design, video functionality remained largely under wraps until its official unveiling. To better facilitate video viewing on the iPod nano, Apple outfitted the 3rd generation iPod nano with a widescreen display, and clamped it into a wider form factor. Images of the "fatboy" nano, which Apple had taken down via a cease and desist order, first appeared on 9to5mac.com a full two weeks before its September 5, 2007 intro. And whenever Apple sends a cease and desist letter, you can pretty much bet that a leak is the real deal. Like the fatboy nano, a leaked image of the 4th generation iPod nano -- courtesy of Digg's Kevin Rose -- appeared a little over 2 weeks (actually, 17 days, but who's counting) before its unveiling. Unlike its predecessor, however, leaked images of this model weren't taken down by Apple's legal eagles. Back before there was Intel there was IBM. And back then, the G5 processor was a big deal. In its heyday, a cluster of G5 Xserves powered Virginia Tech's System X, which at the time was one of the world's fastest supercomputers. In desktop form (there was never a G5-based Apple notebook), the G5 powered the iMac and the Power Mac, where it made its debut at WWDC 2003. 10 days before its debut, however, its specs were leaked...and on Apple's own website, of all places, which Steve Jobs would later poke fun at during the keynote unveiling. Apple's iconic iMac has seen several notable changes in its lifetime: from CRT, to a lamp-like form factor, and to its current design. The current form factor's last major redesign came in early August 2007, which saw the line shed its plastic trim in favor of aluminum. Signs pointing to such a change emerged in late July, when pictures of an aluminum-based, slimmer keyboard began showing up on a Chinese forum. The iPad was so closely guarded that very little was certain about it. One persistent rumor was that it resembled a rather large iPhone, and our siblings at Engadget were able to unearth spy shots to confirm this. Heck, in the process, they were able to spot leaked images of the 4th generation iPhone as well (more on this later). I recently re-watched Groundhog Day for the first time in a long time, and it reminded me a lot of my experience at Macworld 2008. There, Steve Jobs unveiled the 1.3.1 update for the iPhone. Rearrange your Home screen icons: Looks familiar. Location awareness: I've seen this before. SMS multiple contacts: This looks all too familiar. About two and a half weeks prior to its formal introduction, the 1.3.1 update for the iPhone was available for show and tell courtesy of Gear Live. Needless to say, this part of the keynote lived up to expectations in every sense. If there's one hard and fast rule about Apple product leaks, it's that if Apple issues a cease and desist order, then you know the product is legit. That's why leaked pictures of the iPhone 3G, which initially surfaced on iPod Observer, were met with skepticism. The photo, which turned out to be the real deal, floated around the interwebs for a full 67 days before its unveiling at WWDC 2008 -- all without a peep from Apple legal. This time, Apple took legal action. Nearly a week before its unveiling, images of Apple's G4 Cube began circulating on the web. Not only that, sources also highlighted the Cube's feature set (or lack thereof, depending on who you talk to): the limited expandability, its Harman Kardon sound system, and its $1,599 price tag. Apple would later unveil the G4 Cube on July 19, 2000, 6 days after it issued the cease and desist order. Images of the unibody MacBook Pro began surfacing a little over three months -- that's right, over 90 days -- before its official unveiling at an Apple special event in October 2008. 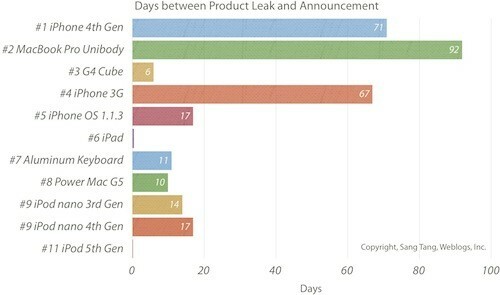 While this puts it at the top of the list in terms of days between initial leak and product launch, its second position reflects several factors. Although the case highlighted a more rounded-contour look, other important details remained a mystery. They include details about the keyboard, trackpad and screen design, each of which (we would later learn) saw significant changes. You got it right: the Greatest of All Time (GOAT) of Apple product leaks. The leaked images, and now video, of the 4th-coming -- my new made-up word -- iPhone tops the list. Historically, WWDC has been the stage for new iPhone releases, and rumors suggest a possible June 28 date for this year's WWDC kickoff. This puts a potential 71 days between leak and launch. Let's start with the fact that the presumed design of the 4th generation iPhone is significantly different from its predecessors. In the evolution-revolution continuum, the 4th generation iPhone is a coup d'etat in form and function: sporting different shapes in different places and significantly upgraded technical features. Most of the iPhone's maladies that its critics point at, as well as features that its fans desire, are addressed in the update: front facing camera, better camera with flash and higher resolution screen among them. Shortly after the iPad unveiling, Apple held a town hall meeting, during which Steve Jobs addressed several notable issues. To the question of the iPhone competing with Android-based offerings, Jobs suggested upcoming updates that Android won't be able to keep up with. The next iPhone, according to him, will be an "A+ update." Looks like he wasn't kidding. Update: Commenters suggest a missing list entry -- the 'Luxo' iMac G4 appearing on the Web cover of Time magazine's Canadian edition one day before the official announcement. Not so much a leak as a cooperative effort with Apple combined with a publishing screwup, but it deserves an honorable mention.